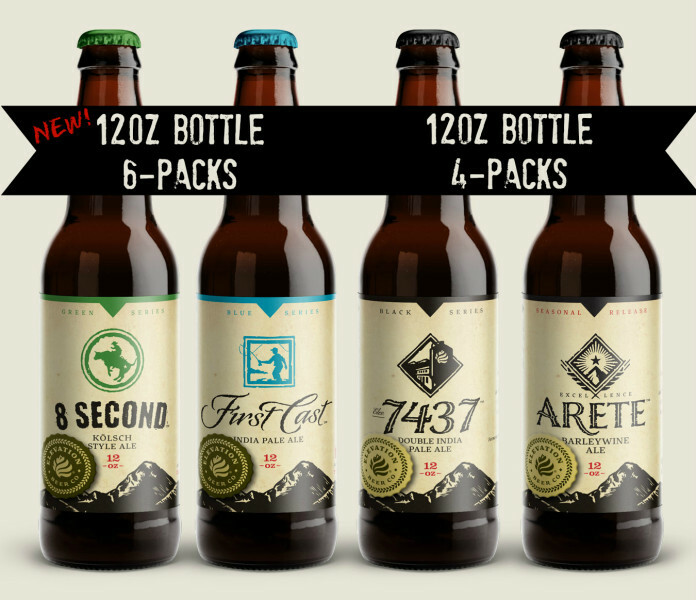 (Poncha Springs, Colorado) – Starting this April, Elevation Beer Company will be making a change to 12oz bottle 6-packs across Colorado for their Blue and Green Series’ of beers. The change also allows Elevation to start using 100% Colorado-made bottles and to drastically reduce their carbon footprint, as the previous 500ml bottles were made in Germany. Elevation will start selling its 8 Second Kölsch, First Cast IPA, and Little Mo’ Porter in 6-packs starting in April, with beers like their Apis IV Belgian Honey Quad, 7437 Double IPA, and other Black Series seasonals coming to 12oz bottle 4-packs in mid-May. Elevation will still be keeping their Double Black Series of barrel-aged beers in their traditional 750ml corked and caged format. “It will be the same great beer, but in a friendlier package, both to our fans and to the environment,” Sheila exclaims.